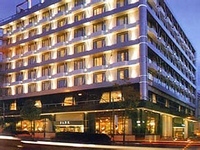 The hotel of parks is a hotel deluxe that is found centrally opposite from by the better parks of Athens and in easy walk the distance is the famous national archaeological museum. Inviting lobbies of hotel it greets the searches in order to it relaxes and it enjoys all the comforts of hotel deluxe. Create a hot, familiar atmosphere, the modern regulation of lobby is enriched by the special touches, included the patterns that portray the beauty of art, and the Greek custom. Bath Ensuite, telephone direct-table, refrigerator, completely being air-conditioned, collared TV, service of rooms of 24 hours. Restaurant of "Alexandra", garden of barriers, roofs "Astra", roofs swimming-pool with the opinion, gifts shop, hairdresser (for the men and the women), exchange office, teletype of also cables service of pianos cocktail of coffees (you open 24 hours daily), "Venus of" "parks", that the garage with the interval for 300 vehicles.